WILMORE, Ky. — High school students in grades 8-12 have the opportunity to participate in the American Mathematics Competition (AMC) hosted on Asbury University’s campus on February 7. The event will be held in the Kinlaw Library, and the cost is $5 per student. Registration includes lunch and an afternoon session with Asbury math students and faculty. A program of the Math Association of America, AMC provides great experience for college and career resumes and is the starting point on the path to the United States of America Mathematics Olympiad and USA Junior Mathematical Olympiad. 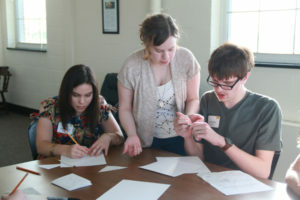 Register for the American Mathematics Competition at Asbury. The event hosted by Asbury’s Math department will include two competition levels, AMC 10 and AMC 12. Each competition is a 25-question, 75-minute multiple choice examination on high school mathematics designed to promote the development and enhancement of problem-solving skills. The AMC 10 contest covers material usually associated with grades 9 and 10, and the AMC 12 contest covers the high school math curriculum, excluding calculus. To challenge students at all grade levels, and with varying mathematical skills, the problems range from fairly easy to extremely difficult. To learn more about Asbury’s Math Department, visit asbury.edu/math.